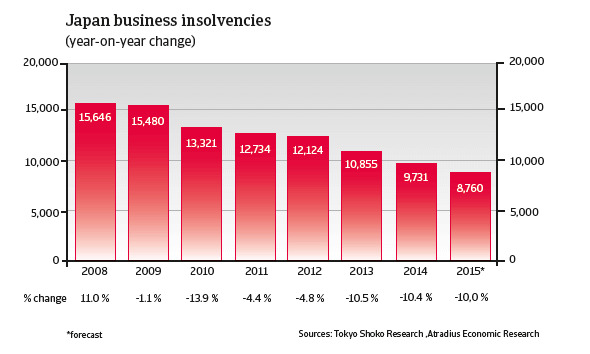 Since 2009, annual corporate insolvencies in Japan have decreased. 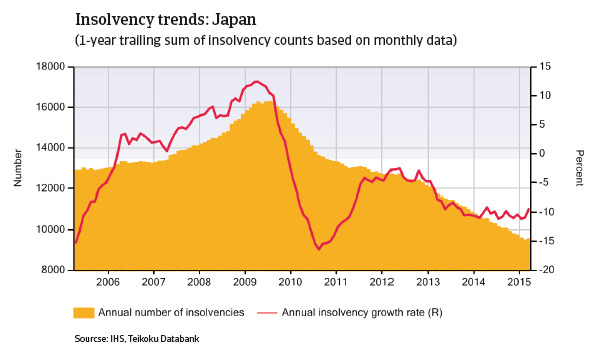 It is expected that insolvencies will decrease further in 2015, by 10% (see chart below). However, smaller players in some sectors like retail and construction are more vulnerable due to shrinking margins. Additionally, businesses that rely on imported products also face increased expenses due to the depreciation of thec Japanese Yen, which could hurt their financial resilience. In the 20 years leading up to 2013, Japan suffered from very low inflation, with bouts of deflation and low economic growth. Prime Minister Shinzo Abe, who came into office in December 2012, immediately launched drastic measures to turn around Japan’s contracting and deflationary economy. Abe devised the so called ’three arrow’ approach, now dubbed ´Abenomics´, consisting of drastic monetary easing, fiscal policy measures and structural reforms. In July 2013, he secured a comfortable majority in the upper house, followed by a victory in the December 2014 snap elections, as he was able to maintain a two-thirds majority of his centre-right coalition government consisting of the Liberal Democratic Party (LDP) and the smaller Komeito party. Together with a loose monetary policy, a large fiscal stimulus package launched in February 2013 helped to increase economic growth by 1.6% in 2013. 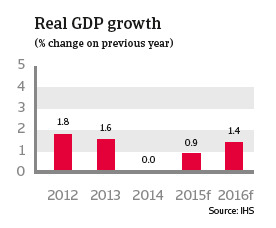 However, in 2014 GDP growth levelled off, mainly due to a 1.2% contraction in private consumption, which accounts for around 60% of the Japanese economy. The decrease in household spending was due to value added tax increase in April 2015, implemented in order to consolidate the high public deficit. 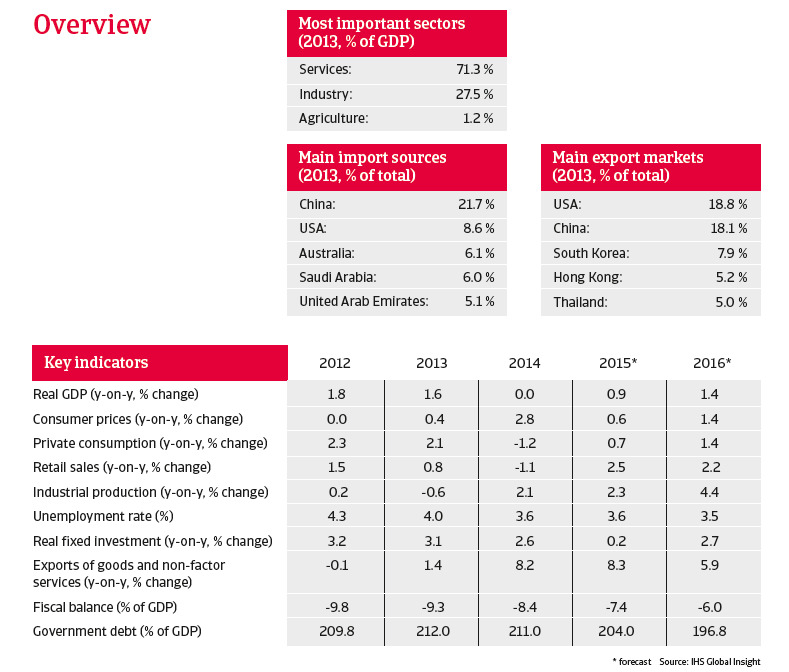 In 2015 the economy is expected to grow 0.9%, followed by 1.4% growth in 2016 as private consumption is expected to rebound and export growth remains robust. The April 2014 value added tax increase from 5% to 8% had a significant impact on consumer spending. While durable goods purchases increased sharply in the months leading up to the tax rate hike, it had a negative effect on consumer spending afterwards. 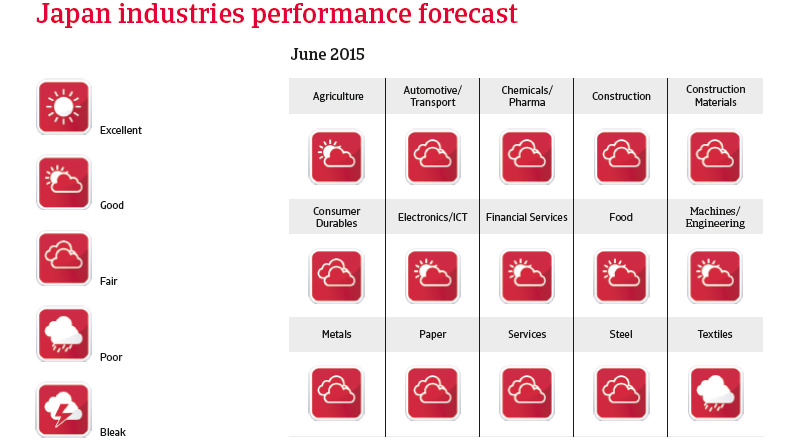 However, a rebound is expected in 2015 due to strong employment figures and good stock price performance. This is also helped by the postponement of a further value added tax increase until April 2017 (originally a rise to 10% was planned for October 2015, but on the assumption that household consumption does not decrease sharply). After decreasing in H2 of 2014 consumer confidence has been on the rise since the beginning of 2015. 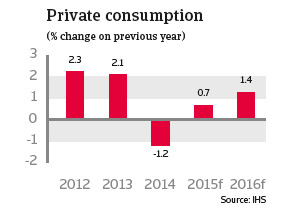 Private consumption is expected to grow 0.7% in 2015, and 1.4% in 2016. In March 2013 the governor of the Bank of Japan announced that the bank will abandon interest rates as a target, focusing instead on the monetary base. Since then it has expanded the monetary base through the purchase of long-term bonds (quantitative easing). This programme aims to devalue the Japanese Yen in order to promote exports, discourage imports and generate inflation. The Bank of Japan is committed to bringing inflation up to 2% to combat Japan’s structural deflation, which has depressed domestic consumption as businesses and consumers alike have delayed purchases in the hope of getting a better deal in the future. The hope is that, by expanding the amount of cash in circulation, businesses and consumers will have more cash to spend. Capital expenditure is key to the Bank of Japan´s massive stimulus programme, which aims to change the perception that deflation will persist so that companies will start investing rather than hoarding cash. Coupled with low interest rates, prices should increase and property and shares should become more attractive propositions. The quantitative easing programme was expanded in October 2014 and will continue in 2015. 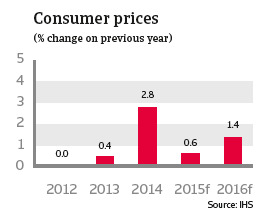 After a 2.8% increase in 2014, mainly as a result of the tax hike, consumer prices are expected to rise 0.6% in 2015 and 1.4% in 2016. The Bank of Japan’s loose monetary policy has led to depreciation of the Yen, boosting exports. 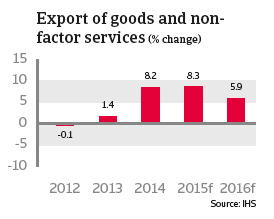 In 2014 exports of goods and services increased 8.2% and are expected to increase 8.3% in 2015 and 6.0% in 2016. This helps to keep the current account balanced in 2015 and 2016, despite the fact that the Yen devaluation makes US dollar denominated imports more expensive. Japan´s current account is also helped by the lower oil price, given that purchases of fossil fuels and gas have increased in recent years, to make up for the loss of nuclear power following the March 2011 earthquake and tsunami. Following a long period of loose fiscal policy, the Japanese government is struggling with extremely high public debt: over 200% of GDP. Japan relies mostly on domestic creditors to support its government debt (about 90% is held by Japanese investors), which makes the funding base less susceptible to capital flight. But maintaining this level of debt is costly and further growth of the government debt would at some point render it unsustainable. 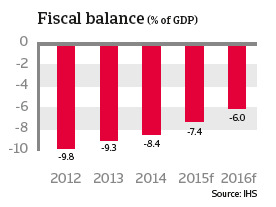 That said, structural reform measures and the April 2014 tax increase will help to decrease the fiscal deficit, to 7.3% in 2015 and 6.0% in 2016, while government debt is forecast to drop below 200% next year. Outlook: will structural reforms be implemented? So far, it seems that the so-called ‘Abenomics’ is working. 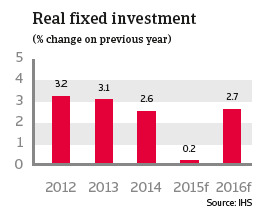 Inflation is expected to increase again in 2016, and the economy continues to grow. Nonetheless, Japan still faces some major challenges. Despite the current decreasing trend the fiscal deficit is high and the country faces demographic challenges: the population is shrinking and the working age population is also declining. Without appropriate measures, the Japanese will inevitably face a shrinking tax base and rising expenditures on retirement benefits. Many industries already face some difficulties due to a lack of workforce, leading to higher labour costs and hurting their international competitiveness. With the outcome of the December 2014 election result Prime minister Abe has a strong mandate to implement necessary reforms and get the economy on the right track. To achieve a sustainable rebound and to boost the country’s long-term economic performance, there is an urgent need to make the labour market more flexible, to end protection for farmers, doctors and pharmaceutical companies, and to introduce more business deregulation. The government has announced its intention to tackle those issues in its current term, but all of those reforms are still vehemently opposed by powerful interest groups. Japan faces major demographic challenges.